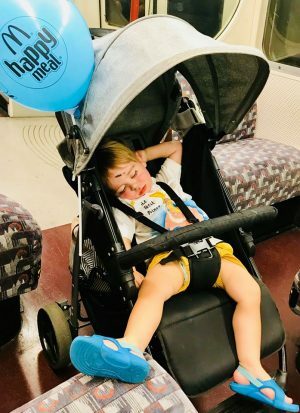 It’s been a year in the making, but after reaching out to Mumsnet for help to develop a better, ‘happier’ kids meal menu, the all new McDonald’s Happy Meal has arrived! As part of its reveal we were invited to the lunchtime launch party in London to try it out. McDonald’s surveyed over 1000 Mumsnetters. So, what did we want? 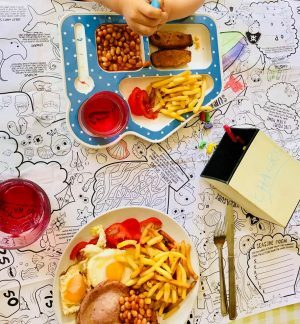 Well it was almost unanimous with 93% of parents wanting to be able to customise their kid’s meals with healthier more nutritious options and almost 8/10 of us asking for a grilled chicken option. The result of which being the new McDonald’s fully customisable, kids sized, grilled chicken and salad wrap. The day of the launch party was also Yannis birthday. His only preference was a birthday burger as soon as humanly possible. On arrival we were guided over to the new self serve kiosks. Theon selected his own meal using the latest touch screen, ordering system. Now you might need to sit down for this next update as despite the rugrat not giving two hoots about it, it left me and his dad in awe. We do possibly need to get out more. McDonald’s are now allowing you to avoid queuing with your hangry ankle biters and opt for table service without so much as a surcharge or mandatory tipping fee. As you can see the food went down a treat. I had to remind Theon to breathe as he wolfed down his chicken, lettuce and cucumber wrap, with a side of melon and a bottle of water. 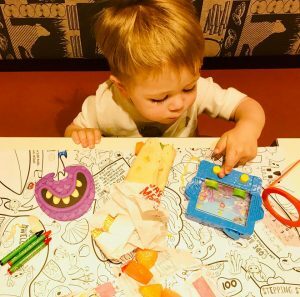 As I watched him begin to eat, it soon became clear that every element of the Happy Meal had been considered from both a child and parents point of view. Even the water bottles were kid friendly sized with a handy sports cap. This meant we could tuck into our food without having to worry about a dreaded, tsunami spill. The new addition to the menu is the latest step McDonald’s has taken to improve the choice available across its menu. Today, families can choose organic milk or water with their Happy Meals and swap out fries for carrot sticks or a fruit bag. 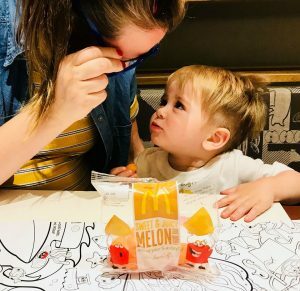 They’ve also worked hard to improve the nutritional content of the typical Happy Meal so that it now contains 21% less salt, 20% less sugar and 10% less saturated fat content compared with 2006. Which regardless of your opinions on convenience food, is unarguably a huge leap into the right direction. But it’s not just the fact that its nutritional value has increased that’s winning more and more parents (including us) around, Happy Meals have always been great value for money and designed to be fully interactive as well as educational: See Toddler above relaxed as if in his natural habitat, engrossed and entertained in his iconic Happy Meal toy. Which it appears grown-up humans seem to enjoy just as much, if not more! 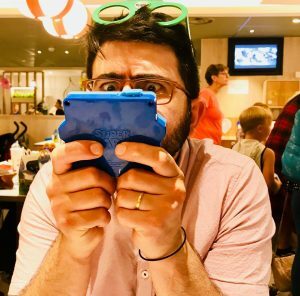 Either way, with everyone happily entertained and chowing it meant I got to get my chops around a Big Mac in peace, like actually fully chew each bite without even a quiver of indigestion. Total mum win! 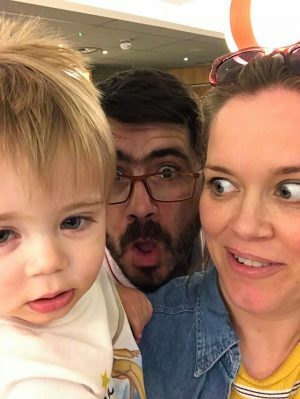 All three of us had a fantastic time at the launch and want to give a big thank you to both Mumsnet and McDonalds for the fab entertainment and food they provided for all the attending kids and their families. Now, before I sign off I’m going to be up front with you; when we were first invited to this launch I had some internal conflict as to whether or not we should go. One side of me yelped a ‘Hoorah, we’re going to McDonalds!’ while a small part of me winced ‘What will people say?’, I mean you’re not meant to publicly admit to consuming convenience food are you? It’s not very #ontrend, but the truth of the matter is, despite thoroughly enjoying cooking and raising my son in an Anglo-Hellenic household where the kitchen and its wares are the heart of our family, there are days-like today for example: I’m 39 weeks pregnant, we’ve been away in London all weekend, the cupboards are bare, the laundry basket is full and I haven’t got the car to nip to the shops. I’ve had no choice but to reach for the freezer and heat up whatever ‘yellow’ food I can get my hands on. 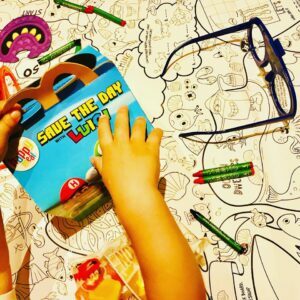 Oh, what I’d give for it to be the McDonald’s kids meal party today because in all honesty what we ate then was far more nutritious and a million shades less beige than todays offerings. We all worry as to whether our kids are eating enough and if they’re getting the right amount of, well, everything! That’s part of what makes us good parents. However, the fact of the matter is just like not every day is a raid the freezer day, not every day is a dine out day, but when a kid needs to be fed, they need to be fed and if that can be done quickly, affordably and with their nutritional needs met, then I’m all in! And why just take my word for it? They say a picture paints one thousand words. 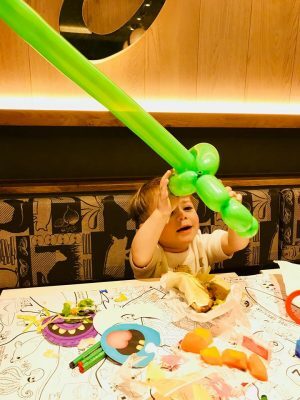 Possibly the best image of the day; fed and watered to the max, with balloon and toys in tow if that’s not the look of shear contentment then I don’t know what is! Want to see more of the fun we had? Then check out our video footage of the day, below. Don’t forget to subscribe. 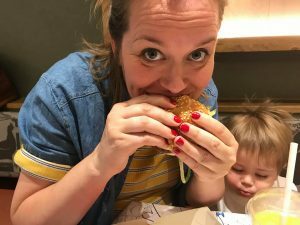 *This is a paid post sponsored by McDonalds in partnership with Mumsnet. However, the opinions within this article are completely my own and based upon my experience. 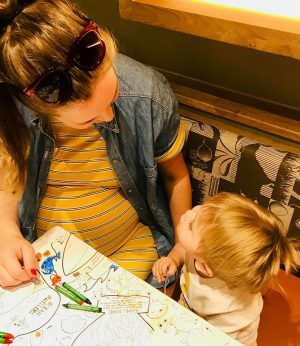 Next Post Mum Guilt: Will He Ever Forgive Me? This is great and I found heading to Mc Donalds when we’re out and about is a winner. Quick food, friendly staff (in my local one they’re mostly mums too) and now table service, they really are upping their game! 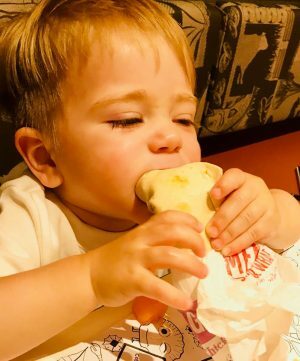 It’s so cool you got to go down to test the new Happy Meal and it looks like Cora would be happy with that wrap so thanks for sharing! That’s it isn’t, I’ve been in London before with Theon and thought I’ll go for a “healthier” option and ended up queuing for 20 mins (with a screaming toddler) to pay £10 for a prepacked sandwich! And then having no where to sit and eat it. We have always loved Mcdonald’s Happy Meal toys but not the meals itself as it was not as healthy. Totally liking their new menu here and we would happily head out to get one now. Definitely, McDonalds is an iconic brand that we’ve all grown up with, but it’s reassuring to know that such a big brand is still listening to the needs of its customers! Wоnderful blog! I found it wһile browsing on Yahoο News. Do you haᴠe any suggestions on how t᧐ get listed in Yahoo News?